The pioneering crime drama Perry Mason returns to DVD with the final 15 episodes from Season Five, digitally remastered on four discs. 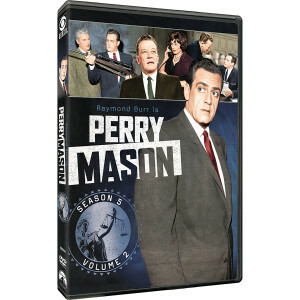 With its riveting murder cases and courtroom confessions, this hit series stars Raymond Burr as Mason, the celebrated attorney who must defend his clients against prosecutor Hamilton Burger (William Talman) and the inquisitive Lt. Arthur Tragg (Ray Collins). Co-starring Barbara Hale as Mason's long-time secretary Della Street, the show also features William Hopper as Paul Drake, Perry's wisecracking but clever eye.